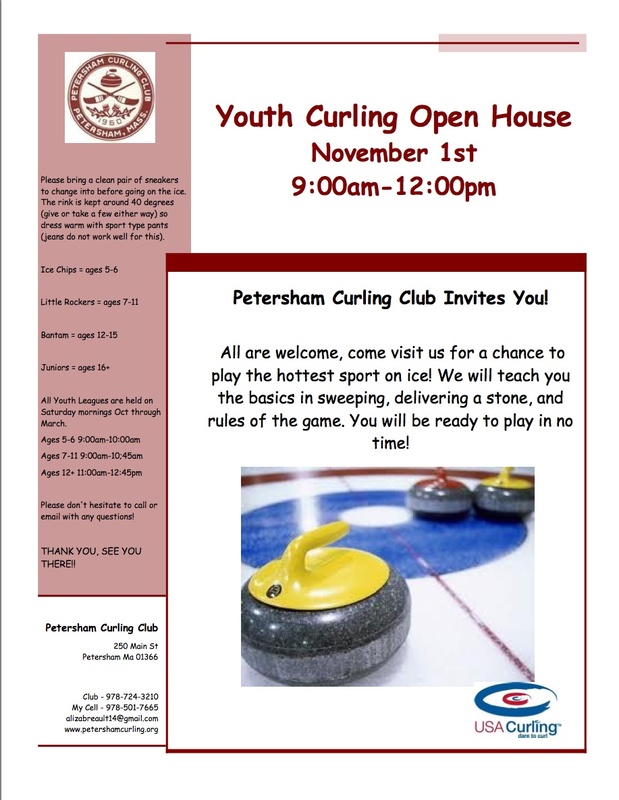 If you have children from age 5 all the way up to 21 and are curious if the sport of curling might be something for them to consider, you can check it out at a Youth Curling Open House happening tomorrow, Saturday, November 1, 2014, at the Petersham Curling Club about 45 minutes south of Keene in Petersham, MA. You can come by any time between 9:00am and 12noon and actually get on the ice to try it out. Learn about “throwing” the rocks (we actually slide them), using the brooms and about some of the strategy that many of us find so fascinating… you should even get a chance to play a bit of a game! Plus you’ll get to meet some of the great youth already playing in the Petersham CC youth curling program and to learn about the benefits of the program. It should be a great time! Please see the flyer below for more info (click/tap on it for a larger version). If you can’t make it tomorrow but are interested in learning more, the Petersham youth curling program takes place on Saturdays from now through March. For a local NH contact, you can email me as I help coaching the “Little Rocks” (ages 7-12) program at the PCC. You can also connect with the Petersham youth curling program on Facebook. Youth curling is a great experience – the kids learn a great amount about the sport and have a lot of fun along the way! This entry was posted in Curling, Youth Curling and tagged Petersham CC, youth on October 31, 2014 by Dan York.